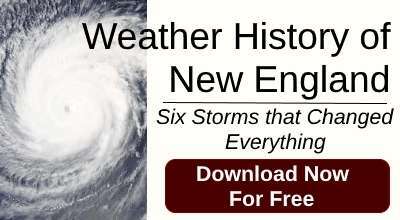 The Valentine’s Day Storm of 1940 barreled into New England just 15 months after The Great New England Hurricane of 1938. 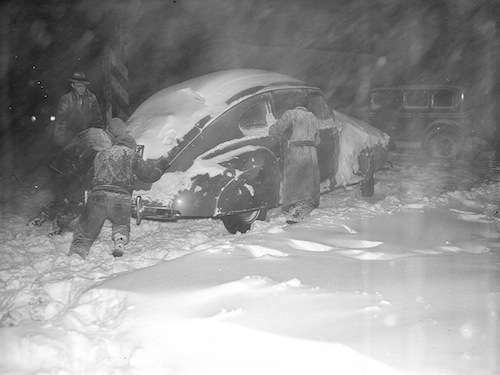 Heavy snows and high winds made it one of the most memorable storms in Boston's history. Pedestrians struggle to stay upright during the Valentine's Day Storm. The storm killed 31 people, paralyzed travel and stranded thousands for days. It closed every department store in Boston, something the Great New England Hurricane hadn’t done. It started benignly with flurries in the morning of Valentine's Day and developed explosively. As the afternoon wore on, the snow began to fall at a rate of three inches per hour -- for seven hours. Winds as high as 60 mph drove drifts as high as 10 feet, making the roads impassable. The National Weather Service forecast rain mixed with snow in the afternoon. Office workers left home in the morning wearing heels and had to struggle through the snow on the way home. Workers struggling through the snow on one of Boston's wharves. 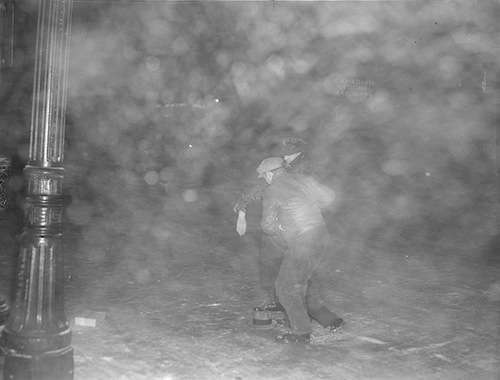 The storm created blizzard conditions throughout New England and into New York and Pennsylvania. It halted all train travel throughout New England. Two thousand people who had come to see Sonja Henie perform at the Boston Garden were stranded. They thronged North Station’s Hotel Manger lobby and restaurant all night long. 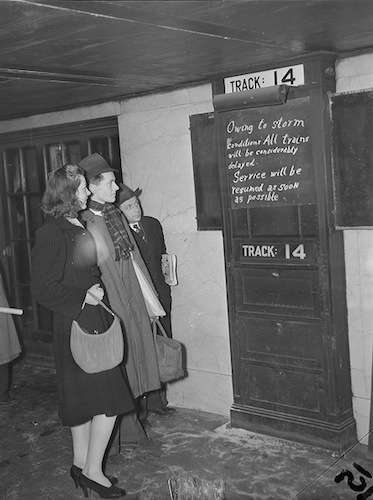 The trains didn’t run until 10 a.m.
Notice of train delays during the Valentine's Day Storm. Some managed to find hotel rooms at pricey rates. When the hotel rooms filled up, hotels put cots in their lobbies and ballrooms. Many Henie fans hung out in hotel bars for several days, still in their dinner jackets and evening gowns. So many cars were stranded that Boston police enforced a ban on automobiles entering the city. An auto stuck in the snow during the Valentine's Day Storm. In Provincetown, the Advocate reported the Valentine's Day Storm began with 'an angry, darkening sky that shone dull green' in the surf. The northeast wind ripped shingles off the town hall with such force that a shingle cut through a parked car. About 25 men and women slept in chairs in town hall overnight. Winds up to 80 mph were recorded along Beach Point. 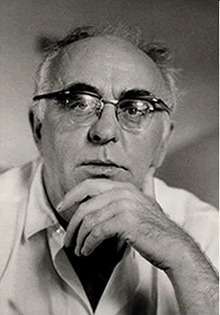 The Valentine’s Day Storm launched the poetry career of Modernist Charles Olson. Olson, then 29, was about to leave Gloucester, Mass., to work in New York City. On the night of the awful storm he left his mother in the house near the Annisquam River, jumped off the porch and wandered down to the bay to be bombarded by sheets of ice blown in from the sea. Years later he wrote an epic series of verse called The Maximus Poems, which alluded to the storm as marking the time he started writing poetry. The next day crowds of men wanting work waited at the City Yards on Albany Street, reported the Boston Globe. 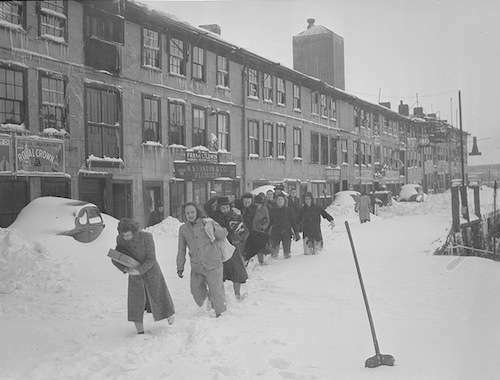 It took 17,000 of them to dig Boston out of the snow, as 9,000 Works Progress Administration workers joined the 7,500 regular public workers and extras. Any man with a shovel could go to the local work yard and get a job. The city ran out of shovels and they had to supply their own. A firefighter tries to shovel out his truck during the Valentine's Day Storm. Emergency workers cleared train tracks with bonfires, oil lamps and flame throwers. 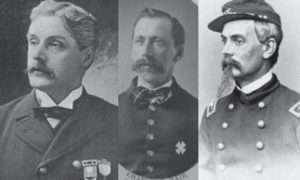 Boston hired 17,000 men to shovel the city out. That included 9,000 WPA employees and 7,500 regular workers. Any man who showed up with a shovel could get work. The shovel was crucial, for the city ran out of them. In Medfield, Mass., the snow was higher than the tops of cars. For days afterward in New Bedford, the family and friends of the crew of the Palmer Island awaited news of the 49-foot dragger, feared lost at sea during the storm. The Coast Guard scoured the seas for it and after three days found the Palmer Island 120 miles south of Block Island. On Sunday, Feb. 18, the Coast Guard towed the vessel back to New Bedford with all 10 crewmen aboard. With thanks to The Boston Globe. Photos, except for Charles Olson, courtesy the Boston Public Library, Leslie Jones Collection. This story about the Valentine's Day storm was updated in 2019. You still coming to work, right? I always worry when they predict flurries! Well that picture puts things in perspective, doesn’t it? 1992 Chicago. Working at Malnati’s and got slammed on carryout. Everyone wanted hot pizza. 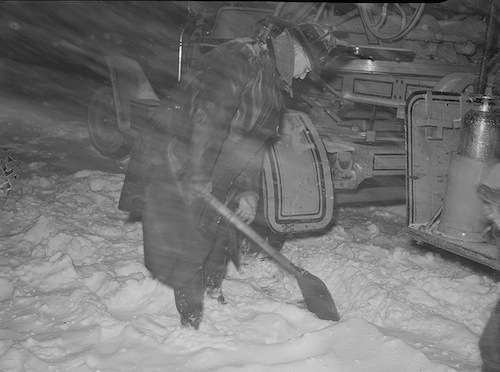 I just read a historical account of 100 men digging out the road from Woonsocket, RI to Providence, RI after a blizzard back in 1928. 16 miles. It took them 3 days! Crazy. We won’t feel so bad snow blowing our driveway this weekend. Sounds like the 38 Hurricane. ^Bob, It was 15 months or so after the ’38 Hurricane. People must have felt then like they feel now — tired of storms!